Ladies Diamond Bridal set Ring with 0.51 carat Round brilliant cut side diamonds. 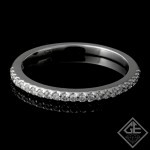 Also available in 14k Rose or White Gold, 18k Rose, White or Yellow Gold and in Platinum. Ladies Diamond Matching Wedding Band with 0.20 carat Round Brilliant cut side diamonds.